Mobile phones, which became indispensable in our daily lives, are likely to be colonized by microorganisms found in the hands of people using them. In this study, a total of 30 mobile phones and owner hands (30) were screened for Staphylococci and E. coli contamination in various departments at Mustafa Kemal University. For this purpose, samples were taken from the mobile phones and index fingers and thumbs of dominant hands of randomly selected 30 students studying at various departments at Mustafa Kemal University, Faculty of Arts and Sciences. Staphylococcus and Escherichia coli colonization were screened in these samples, and their susceptibility to 11 antimicrobials in different groups. And, oxacillin salt agar screening test was performed to detect methicillin resistance. Microplate (MP) method, Congo Red Agar (CRA) method and Standard Tube (ST) method were used to determine biofilm formation. A questionnaire about mobile phone usage habits was also applied to statistically investigate whether the colonization depends on the usage. According to our results, E. coli colonization was no found in any sample, while 31 samples were isolated as Coagulase-Negative Staphylococci (CoNS) and 2 samples as Staphylococcus aureus. Out of 30 samples collected from the mobile phones of the students, 53.3% was found as CoNS and 3.3% as Staphylococcus aureus. Whereas, among 30 samples collected from the hands of the students, CoNS was isolated in 50% and Staphylococcus aureus 3.3% of the samples. All 33 Staphylococci isolates were found to be susceptible to vancomycin and rifampicin, while 27% were found to be resistant to oxacilline, 36% to cefoxitin, 70% to ampicillin, 48% to tetracycline, 76% to erythromycin, 70% to penicillin, 30% to gentamicin, 30% to ampicillin-clavulanicase, 24% to ciprofloxacin, 27% to ciprofloxacin, 27% to trimethoprim/sulfamethoxazole and 27% to methicillin. It was determined that 9 (27.2 %) of the 33 Staphlococci isolates was resistant to methicillin. Staphylococci were 100% biofilm producers according to the microplate method. Especially hand hygiene should be carefully provided and mobile phones should be regularly cleaned in order to prevent bacterial colonization of mobile phones, and prevention strategies should be developed in terms of public health. Tagoe, D.N. ; Gyande, V.K. ; Ansah, E.O. Bacterial Contamination of Mobile Phones: When Your Mobile Phone Could Transmit More Than Just a Call. Webmed Central Microbiology. 2011; 2(10), WMC002294. Borer, A.; Gilad, J.; Smolyakov, R.; Eskira, S.; Peled, N.; Porat, N.; Hyam, E.; Trefler, R.; Riesenberg, K.; Schlaeffer, F. Cell phones and Acinetobacter transmission. Emerg. Infect. Dis. 2005; 11, 1160-1161. Ulger, F.; Dilek, A.; Esen, S.; Sunbul, M.; Leblebicioglu, H. Are healthcare workers’ mobile phones a potential source of nosocomial infections? Review of the literatüre. J. Infect. Dev. Ctries. 2015; 9(10), 1046-1053. Thomas, W.; Oller, A.R. Staphylococcus and Pseudomonas isolated from mobile phones and cheek and ear locales. British Journal of Medicine & Medical Research. 2016; 11(6), 1-8. Grice, A.E. ; Segre, A.J. The skin microbiome. Nat. Rev. Microbiol. 2011; 9(4), 244–253. Karabay, O.; Kocoglu, E.; Tahtaci, M. The role of mobile phones in the spread of bacteria associated with nosocomial infections. J. Infect. Dev. Ctries. 2007; 1, 72-73. Jayalakshmi, J.; Appalaraju, B.; Usha, S. Cellphones as reservoirs of nosocomial pathogens. J. Assoc. Physicians. Ind. 2008; 56, 388-389. Singh, S.; Acharya, S.; Bhat, M.; Rao, S.K. ; Pentapati, K.C. Mobile phone hygiene: potential risks posed by use in the clinics of an Indian dental school. J. Dent. Educ. 2010; 74, 1153-1158. Srikanth, P.; Rajaram, E.; Sudharsanam, S.; Lakshmanan, A.; Mariappan, U.S.S. ; Jagannathan, K. Mobile phones: emerging threat for infection control. J. Infect. Prev. 2010; 11, 87-90. Tekerekoǧlu, M.S. ; Duman, Y.; Serindağ, A.; Cuǧlan, S.S.; Kaysadu, H.; Tunc, E.; Yakupogullari, Y. Do mobile phones of patients, companions and visitors carry multidrug-resistant hospital pathogens? Am. J. Infect. Control. 2011; 39, 379-381. 11] Martins, A.; Cunha, Mde.L. Methicillin resistance in Staphylococcus aureus and coagulase-negative staphylococci: epidemiological and molecular aspects. Microbiol. Immunol. 2007; 51, 787-795. Kramer, A.; Schwebke, I.; Kampf, G. How long do nosocomial pathogens persist on inanimate surfaces? A systematic review. BMC Infect. Dis. 2006; 6, 130. Szczuka, E.; Kaznowski, A. Antimicrobial activity of tigecycline alone or in combination with rifampin aga¬inst Staphylococcus epidermidis in biofilm. Folia Microbiol. (Praha). 2014; 59, 283-8. Livermore, D.M. Antibiotic resistance in staphylococci. International Journal of Antimicrobial Agents. 2000; 16, 3–10. Clinical and Laboratory Standart Institute -CLSI. Performance Standarts for Antimicrobial Susceptibility Testing. 17th Informational Supplement. CLSI document M100-S22. CLSI, Wayne, Pennsylvania, USA, 2012. Freeman, D.J. ; Falkiner, F.R. ; Keane, C.T. New method for detecting slime production by coagulase negative staphylococci. J. Clin. Pathol. 1989; 42(8), 872–874. Christensen, G.D.; Simpson, W.A. ; Younger, J.J.; Baddour, L.M. ; Barrett, F.F. ; Melton, D.M. ; Beachey, E.H. Adherence of coagulase-negative staphylococci to plastic tissue culture plates: a quantitative model for the adherence of staphylococci to medical devices. J. Clin. Microbiol. 1985; 22(6), 996– 1006. Türkyılmaz, S.; Eskiizmirliler, S. Detection of Slime Factor Production and Antibiotic Resistance in Staphylococcus Strains Isolated from Various Animal Clinical Samples. Turk. J. Vet. Anim. Sci. 2006; 30, 201-206. Shahaby, AF. ; Awad, N.S. ; El-Tarras, A.E. ; Bahobial, A.S. Mobile phone as potential reservoirs of bacterial pathogens. African Journal of Biotechnology. 2012; 11, 92. Chitlange, R.P. Contamination of cell phones by pathogenic microorganisms: Comparison between hospital staff and college students. Nusantara Bioscience. 2014; 6(2), 203-206. Koroglu, M.; Gunal, S.; Yildiz, F.; Savaş, M.; Ozer, A.; Altindis, M. Comparison of keypads and touch-screen mobile phones/devices as potential risk for microbial contamination. J. Infect. Dev. Ctries. 2015; 9(12), 1308-1314. Furuhata, K.; Ishızaki, N.; Sogawa, K.; Kawakami, Y.; Lee, S.; Sato, M.; Fukuyama, M. Isolation, identitification and antibacterial susceptibility of Staphylococcus spp. associated with the mobile phones of university students. Bioscience Control. 2016; 21 (2), 91-98. Seuli, S.; Siddhartha, S.; Malik, M. Isolation and identification of bacteria of public health importance from mobile phones of fish and animal handlers of Kashmir, India. Afr. J. Microbiol. Res. 2013; 7(21), 2601-2607. Yusha’u, M.; Bello, M.; Sule, H. Isolation of bacteria and fungi from personal and public mobile cellphones: A case study of Bayero University, Kano (Old Campus). Int. J. Biomed. Health. Sci. 2010; 6, 97–102. Braddy, C.M. ; and Blair, J.E. Colonization of personal digital assistants used in a health care setting. Am. J. İnfect. Control. 2005; 33, 230-232. Daka, D. Antibiotic-resistant Staphylococcus aureus isolated from mobile phone and hands of Health care workers in the Hawassa referral Hospital, South Ethiopia. Journal of Microbiology and Antimicrobials. 2014; 6(4), 72-78. Brady, R.R. ; Hunt, A.C.; Visvanathan, A.; Rodrigues, M.A. ; Graham, C.; Rae, C.; Kalima, P.; Paterson, H.M.; Gibb, A.P. Mobile phone technology and hospitalized patients: a cross-sectional surveillance study of bacterial colonization, and patient opinions and behaviours. Clin. Microbiol. İnfect. 2011; 17, 830-835. Rafferty, K.M. ; Pancoast, S.J. Brief Report: Bacteriological Sampling of Telephones and Other Hospital Staff Hand-Contact Objects. Infection Control. 1984; 5(11), 533-535. Brady, R.R. ; Wasson, A.; Stirling, I.; McAllister, C.; Damani, N.N. Is your phone bugged? The incidence of bacteria known to cause nosocomial infection on healthcare workers' mobile phones. J. Hosp. Infect. 2006; 62, 123-125. Brady, R.R. ; Fraser, S.F. ; Dunlop, M.G. ; Paterson-Brown, S.; Gibb, A.P. Bacterial contamination of mobile communication devices in the operative environment. J. Hosp. İnfect. 2007; 66, 397-398. Ulger, F.; Esen, S.; Dilek, A.; Yanık, K.; Günaydın, M.; Leblebicioglu, H. Are we aware how contaminated our mobile phones with nosocomial pathogens? Ann. Clin. Microbiol. Antimicrob. 2009; 8, 7. Vickery, K.; Deva, A.; Jacombs, A.; Allan, J.; Valente, P.; Gosbell, I. Presence of biofilm containing viable multiresistant organisms despite terminal cleaning on clinical surfaces in an intensive care unit. J. Hosp. Infect. 2012; 80(1), 52–5. Russotto, V.; Cortegiani, A.; Graziano, G.; Saporito, L.; Raineri, S.M. ; Mammina, C.; Giarratano, A. Bloodstream infections in intensive care unit patients: distribution and antibiotic resistance of bacteria. Infect. Drug. Resist. 2015; 8, 287–296. ISNAD Yılmaz, Ebru Şebnem , Çetin, Serpil Kuvvet . "Investigation of Staphylococcus spp. and Escherichia coli colonization and biofilm formation on university students’ mobile phones and hands". 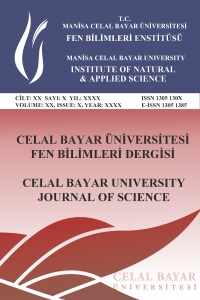 Celal Bayar University Journal of Science 13 / 4 (December 2017): 839-844.